Albert C. Bowerman was an active and able genealogist in the late 1890's. He interviewed the older locals, consulted records and read widely. Much of what he records is well known but there are many gems hidden in this work. 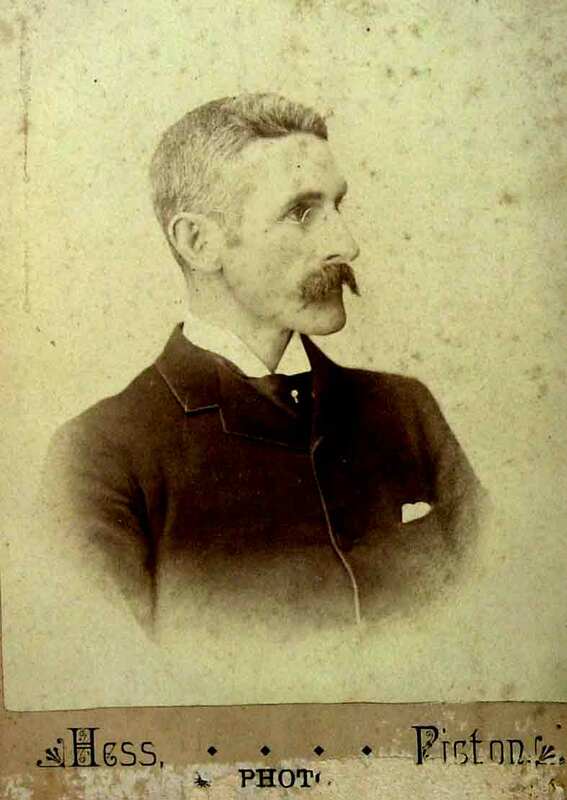 Albert was born 22nd June 1850 in Bloomfield son of Gideon Hughes Bowerman and Mary Christy. He became a medical doctor and married first Ida E. Bedell, dau of W.N. Bedell and Elizabeth Wilson on 30 July 1879 in Bloomfield. Ida died 12th Aug 1891 and they had no children. On 19 Aug 1895 he married Lillian Thorne dau. of James P. Thorne and Helen Augusta Herrington of Picton. They had two children, Albert and Lillian, and moved to California sometime in the early 1900's. Albert died on 28 May 1917 in Lindsay, CA. The 1904 work below contains the material for his 1904 Bull and 1916 Bowerman works and much more. 1904 - The Bowerman Family of Canada Descendants of Ichabod Bowerman of Dutchess County, NY, 16?83 - 1796, dated July 1904. This typed and edited manuscript is held at the Canadian Quaker Archives, Newmarket, ON in the Marion Cronk Fonds. It is believed that this is the only surviving copy and that it was never published. A few of the sections named in the index are missing. A. C. Bowerman Notes - loose material found with the above work. 1916 - Bowerman Family of Ontario, Canada, 1633 - 1916 being Descendants of Ichabod Bowerman and Lydia Mott. This is a shorter version of the above work and Lorne Shunk gave permission for his transcription to be posted on this site. This copy was dated 1916 and likely never published. It appears that Albert prepared this version that focuses on the Bowerman family from the above more extensive version. Genealogical List of the Bull Family of the County of Prince Edward. Published in Papers and Records of the Ont Historical Society, 1904 and posted on Bill Martin's web site. Is Albert's middle name Christy or Claude? David Bennett Bowerman, 1862-1930, is a second cousin of Albert. David also emigrated to Glendale, CA. David wrote a Bowerman genealogical history and two copies are known. One is in Folder 5-1 of the Marion Cronk Fonds in the Canadian Quaker Archives and the other comes from Merton Y. Williams and is held in the Prince Edward Archives at Wellington. DBB states that Christy is the middle name of Albert [5-1, 18]. It is my conclusion that DBB knew ACB very well and probably copied much of the work of ACB for his own version. Quaker, civil records and also the works of ACB himself; all give Albert C. Bowerman as his name leaving the "C" a mystery. A contact has reported that Claude is stated as the middle name for Albert in the Directory of Deceased American Physicians, 1804-1929. Claude is also given on several on line databases. Hopefully someone can help clarify this issue.